I’ve seen a lot of bad things during this financial crisis, but this is the most disgusting thing I’ve seen so far. At a time when one out of four homeowners are underwater, banks are using a mortgage modification program to pile on more debt on these loans. They do this even when it’s well known the correlation between the level of being underwater and default. How? From the report: “Servicers routinely capitalize delinquent interest, corporate advances, escrow advances and attorney fees and other foreclosure-related fees and expenses into the loan balance when completing a loan modification.” So fees allow them to make it look like they are doing their clients a favor, while all they are really doing is running them in a big circle. So I’ll ask the obvious question. 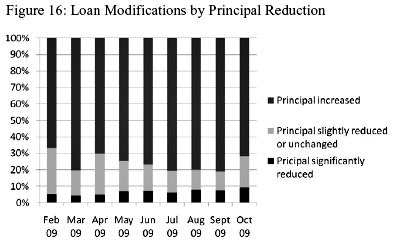 Is the current system predatory?….Within 1 year almost 45% of modified loans become “delinquent.” 7-9% reach 60-day delinquency within just the first three months after modification, which for all intents means the borrower didn’t make the first post modification payment. ….So we have a financial technique offered to consumers that (a) piles on principal unexpectedly through hidden fees and surcharges and (b) has a reasonable expectation that the consumer won’t be able to make the payments. That doesn’t sound good, does it? Lawyers in the audience, would you consider this predatory? How do those arguments proceed? The defeat of the bankruptcy proposal is a testament to the enduring influence of banks, even as the industry struggles financially and suffers from its role in the economic crisis. ….Documents and interviews with lawmakers, lobbyists and administration officials show that the banks defeated the bankruptcy change — the industry picturesquely calls it the “cramdown” provision — by claiming that it would push up interest rates and slow the housing market’s recovery, even though academic studies have countered such claims. The industry also steadfastly refused offers to negotiate over a weaker version. And it poured millions of dollars into lobbying: four of the industry’s top trade groups spent nearly as much on lobbying in the first three months of this year as they did in all of 2001. But an industry strategy of dividing the Democrats had the most success. One target was Senator Mary Landrieu, the moderate Democrat from Louisiana. On April 1, about 30 bankers from Louisiana crowded into a room off the Senate floor to press their view that the bankruptcy measure would force them to raise mortgage rates and hurt the very homeowners Congress was seeking to help. Donnie Landry, a senior executive vice president at MidSouth Bank of Lafayette, La., recalled that last year Ms. Landrieu had “not been very receptive to some of our concerns. But this time she could not have been more cordial,” even helping them get to see Senator Christopher J. Dodd, the Connecticut Democrat who is the chairman of the Senate banking committee, while they were at the Capitol. Etc. Not only did the banks utterly defeat the cramdown proposal, they actually managed to add billions of dollars in extra bailout money for themselves at the same time. Read the whole thing for the entire gruesome story. I should note that I relied heavily on Labaton’s reporting for the finance lobby piece I wrote in the current issue of the magazine. If we’d had a couple dozen more like him, the public would have a much better idea of what happened last year than it does.